After I launched my new book (Vote Your Conscience: Party Must Not Trump Principles) yesterday morning, a couple interesting development emerged that fit nicely with what I discuss in the book. Republican Senator Susan Collins of Maine penned a Washington Post op-ed explaining why she won't support her party's nominee. She joins a growing list of Republican politicians refusing to let party trump principles. In fact, 50 GOP national security officials released a letter Monday saying their party's nominee would put he nation "at risk." Additionally, a long-promised independent candidate finally came forward. Some conservative activists have worked for a few months to get someone to run as an alternative to Republican presidential nominee Donald Trump. Key Republican leaders who've refused to endorse Trump (like like Mitt Romney, John Kasich, or Ted Cruz) apparently weren't willing to make the run. 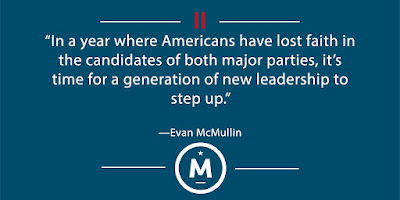 The chosen candidate, Evan McMullin, hasn't held office before. He's been a CIA agent and a staff member for House Republicans. Perhaps his biggest impact will come with Mormon voters in Utah and other western states since Mormon voters (normally strong Republicans) are among the most anti-Trump of conservative voters. McMullin graduated from Brigham Young University and served as a Mormon missionary in Brazil. He also served as a Volunteer Refugee Resettlement Officer in Amman, Jordan, for the United Nations High Commissioner for Refugees. It will be interesting to see if McMullin hits Trump for his anti-refugee rhetoric (a topic I discuss in my new book). In his candidacy announcement, McMullin offers a critique of both Trump and Democratic presidential nominee Hillary Clinton. He laments we have "two candidates who are fundamentally unfit for the profound responsibilities they seek." He calls Clinton "a corrupt career politician who has recklessly handled classified information." And he blasts Trump as "a real threat to our Republic" with "obvious personal instability" and an "infatuation with strongmen and demagogues." These lines echo some of my own critiques of the candidates in my new book. McMullin isn't a candidate who will win. But he offers an alternative for conservative voters who can't in good conscience vote for Trump. I discuss other alternative voting options in my new book, though I'm not endorsing McMullin or any particular third-party candidate. We can send important messages this year as we vote our consciences.